Construction continues to move ahead on Phase 1 of our new addition. Tradesmen have been laying the plumbing for the new building and curbs have been poured for the new parking lot to the North of the building. This weekend demolition will begin as the corridor connecting the White Building to the rest of the facility will be taken out. That will allow for the White Building to come down next week (Monday, July 31). 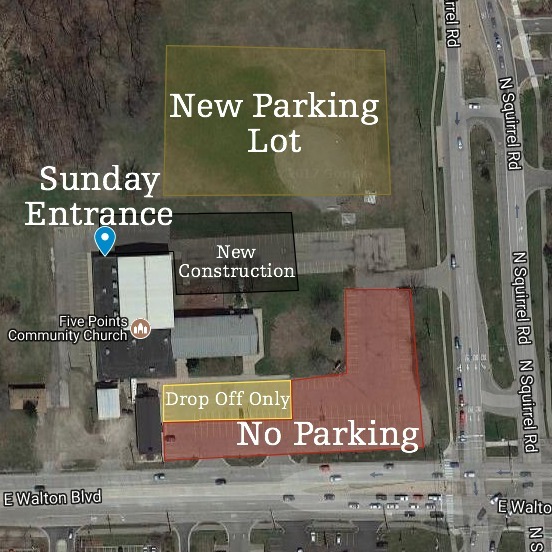 Due to these updates as well as work starting on the new parking lot South of the building (just off Walton Blvd), all vehicles for Sunday will need to be parked in the new North lot. We ask that you then enter at the northwest corner of the building into the hallway near Room J. We look forward to worshiping with you and further pursuing joy in Christ together. Comment below or contact the church office with questions.